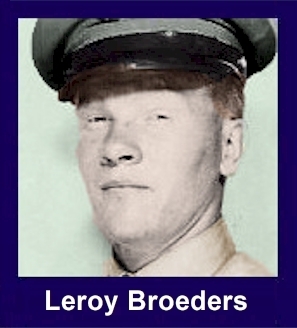 The 35th Infantry Regiment Association salutes our fallen brother, PV2 Leroy J. Broeders, RA16343036, who died in the service of his country on September 10th, 1951 in North Korea. The cause of death was listed as MIA to KIA. At the time of his death Leroy was 18 years of age. He was from Foster City, Michigan. Leroy's Military Occupation Specialty was 4745-Light Weapons Infantryman. The decorations earned by PV2 Leroy J. Broeders include: the Combat Infantryman Badge, the Purple Heart, the National Defense Service Medal, the Korean Service Medal, the United Nations Korea Service Medal, and the Republic of Korea War Service Medal. Leroy was born and buried in Foster City, MI. He had 8 brothers, and 2 sisters. We also found out that my grandfather/father-in-law went with him to sign up for the military, however my grandfather was rejected due to medical reasons. I am just writing to thank everyone out there for sparing your time and helping me to find information about my great uncle Leroy Broeders. It ended up working out perfectly, we found a picture of him and were able to make a memorial board on black silk with the photo, the medals, and all the memorials and other stuff that everyone ended up helping us to find. We also found a photo of the man who pulled my uncle off the field when he was killed, which we were able to put on the board too. This gift was given to my grandfather (Leroys brother) just yesterday at a family function, words could not describe the surprise and emotion on his face, we couldnt beleive it, he cried like a baby, and said "you dont know how close we were" and proceded to talk about his loved, but not forgotten brother..He spoke of how they went together to "join-up", but he was rejected for medical reasons.... it was a very emotional day and a very happy day as well. My grandfather is going to make a safe box of some kind with a hinged glass cover for it, we truly filled a void for him. This does not complete our search however, any new information found would still be greatly appreciated. I took on this project as a memorabilia for my grandfather and to learn about a family member I had never gotten the chance to meet, it has now become a great interest to me, and almost an obsession. This has been a great experience for me, as I have never met my great uncle, I have learned so much about him, and touched so many hearts in doing so, that it is a great joy to have had this opportunity. I am also writing to say to any family members out there looking for information on a loved one, dont give up, it took us quite a while to find information, but it is out there, and you have no idea the kindness and generosity of these "strangers" that are willing to take time to help us in finding what it is that we are looking for. Words cannot express how intriguing these people are to take it upon themselves to try to help, without knowing who we are or anything about us, just knowing that we are in need of assistance they are willing to lend a helping hand, but I guess that is what they are all about, considering they fought for our country so many years ago. If anyone reading this has any additional information I would love to continue learning, and continue to teach my grandfather. So much of this information he didnt even know about his brother that was taken away from him so many years ago. It is all a big mystery to some of us, what really happened out there, and we would all love to find out more about our missed family member the late Leroy Broeders....and again I would just like to thank everyone out there for your help with this project, as everyone in our family was touched, it was a huge success, and we are very grateful for your kindness and generosity.